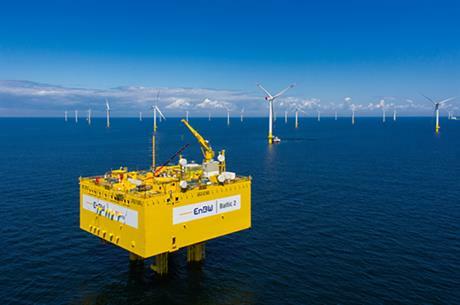 GERMANY: Developer EnBW has given its final investment decision on the 497MW Hohe See offshore wind project in the North Sea, as Canadian energy firm Enbridge acquires a 49.9% stake. The 42-square-kilometre site will be installed 90 kilometres north of Borkum in northern Germany. EnBW and new partner Enbridge will jointly finance and implement the €1.8 billion project, the German developer said. "With Enbridge at our side, we can realise our largest offshore wind farm to date and at the same time generate financial scope through this participation for the development of new projects," said EnBW CEO Frank Mastiaux. The 71-turbine site is due online by the end of 2019. Siemens will supply its SWT-7.0-154 turbines to the project. Enbridge was advised by international law firm Dentons on the acquisition of the project stake. Siemens will also deliver monopile foundations to the project as part of the first turbines plus foundations contract to be awarded in the German offshore wind market. Elsewhere, VBMS has been contracted to supply inter-array cabling, while Engie, Iemants and CG Holdings will work together on the offshore substation. "The Hohe See project is consistent with Enbridge's strategy to increase our presence in the renewable power business and it comes with an additional organic growth opportunity within the European offshore wind market," Enbridge president Al Monaco said. Enbridge also owns stakes in E.on's 400MW Rampion project, under construction off the UK's south coast, and in the Eolien Maritime France consortium developing three sites in France totalling 1.4GW of offshore capacity. As part of the deal between the two companies, Enbridge also has the option to acquire a stake in EnBW's 116MW Albatross project, also planned for a site in the German North Sea. EnBW said its supervisory board is expected to make a final investment decision on the Albatross site in 2017. Project company EnBW Albatros Gmbh was granted a revision of its 2011 permit for the project, as well as the permit for the "DemonstrationsproAlbatros 1" licence granted in 2012. The revised permit — open for public inspection from 16 February 2017 up to and including 2 March 2017 — involves the sharp reduction in capacity to 112MW on a 10 square kilometre area from the originally permitted 395MW on a 62 square kilometre area. The revised permit for Albatros, granted in December, was for 16 turbines with rotor diameter 154 metres, hub height 105 metres, overall height 182 metres and nominal capacity 7MW on monopile foundations with maximum diameter of 8 metres and scour protection with 36 metres diameter. In addition to its own substation, Albatross is to have a cable cross-connection to the Hohe See site. EnBW said the two projects will be able to utiltise construction synergies. The 2011 permit had been for 79 turbines with 5MW each on tripod foundations. The application for a permit revision was lodged in August 2016, for up to 19 turbines and adjusted in a submission in September to just 16 turbines. The capacity had to be reduced to bring it into line with the grid capacity allocation for the project. EnBW Albatros is to be connected to the onshore transmission netwoirk via the HVDC BorWin beta converter station and the BorWin2 cable link.